Happy Release Date to Me! An Angel in Eyeliner Drops Today! 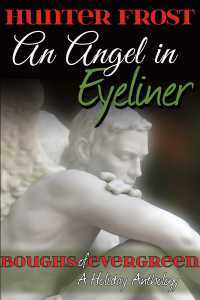 My newest release, An Angel in Eyeliner, from Beaten Track Publishing is now officially for sale as an individual story. This short story is part of the Boughs of Evergreen Holiday Anthology, where 23 authors came together to write about hope, peace, love, and the holiday season. The proceeds for the purchase of the anthology go to the Trevor Project. Please check out my contribution to such a diverse and talented group of authors. All Mitch wants for Christmas is a quiet holiday free from grief. Patching up the target of a mugging in the back alley of his bar seems to throw that wish right out into the cold Chicago night. But the tatted, pierced, and skinny-jean wearing Keller Graham is fearless and proves to be more than a pair of icy blue eyes lined in black. Keller may be a thief, but Mitch never expected him to steal his lonely heart. Purchase the entire anthology here. ← Boughs of Evergreen: A Holiday Anthology to be Released November 21st!